One of the things you notice as you walk through the various cathedrals and abbeys in Europe is that there are a lot of people buried under the floors — thousands, in fact. Westminster Abbey in London, for example, is essentially an indoor graveyard with the remains of dozens of famous and infamous people tucked under the stones or in the niches of that ancient edifice. In Bath Cathedral, some 6,000 people are buried beneath the floors; so many that it has created an underground void that threatens the stability of the church building. While a “great cloud of witnesses” is certainly present in the nave as people worship in these places, there’s also a great number of moldy saints under the flagstones! The Abbey on the Isle of Iona is no exception, although the method of marking the burials is much more understated. Yes, a couple of stone sarcophagi near the altar serve as monuments to abbots buried there, but to see the other burial places, you have to look closer. Several small circles in the floor of the nave are filled with pebbles cemented in place. Some have more pebbles than others and there are no names attached to these little silent monuments. But they are grave markers nonetheless. They are the graves of the many monks who once served Iona Abbey. During our visit last summer, one of the members of the Iona Community told us that these grave markers were unique in that the pebbles came from the beaches of the island — the same beaches where their predecessors from Saint Columba’s first community had landed. The differing number of pebbles, she said, indicates how many years each of these nameless monks served in that particular Abbey and monastery — one pebble for each year of service. These little circles of pebbles thus stand as a silent witness to lives lived for Christ in a faraway place. I found these little monuments to be far more compelling than any of the elaborate gravestones I have seen around the world. Each pebble represents a year in the life of a monk — years of tragedy and triumph, years of wrestling with God’s call, years of praying seven times a day, years of endless chanting of psalms, and years meeting the needs of others who came to the Abbey for respite and hospitality. Even before they became grave markers, these little pebbles had spent thousands of years being rolled and shaped by the sea, perhaps all the way back to the time of creation. They are monuments to a short period of time in the midst of the long story of God. The symbolism intrigued me, so I picked up some rocks from the beach at Iona and carried them all over England and France before returning home. Those pebbles now sit in a bowl on my desk. There are 24 of them to represent each year I have been ordained. On July 1 each year, I will add another one, Lord willing. Instead of Iona granite and limestone, they will be stones from Colorado. Hopefully, there will be a lot more of them added to the bowl, and hopefully, many of them will be taken from right out in front of this church. 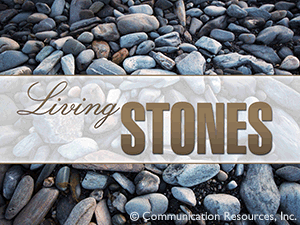 But I am even more grateful for the “living stones” with whom I serve here every day. As Peter wrote to the church of his day, “Like living stones, let yourselves be built into a spiritual house to be a holy priesthood, to offer spiritual sacrifices acceptable to God through Jesus Christ” (1 Peter 2:4-5). My prayer is that my congregation and I will continue to build a spiritual house together out of the stones of years spent serving others and helping them to become more like the “living stone” of Christ Jesus. Like those monks, I hope the pebbles in my bowl will be part of my own gravestone one day when my work on earth is done (although it won’t be under the linoleum in the church basement). I pray that these stones will inspire someone else to keep building, to keep adding to their own collection of years spent serving Christ. I hope you’ll take some time today to celebrate your years of ministry and the living stones you serve! Bob Kaylor is the lead Pastor of Tri-Lakes United Methodist Church in Monument, CO. He is also the Senior Writer for Homiletics, author, clergy transitions guru, Wesleyan theology aficionado, historian, drummer, husband and dad. He is also the author of "Your Best Move: Effective Leadership Transition for the Local Church."